If you think a Highlands NC home remodel add value you are correct. Consider a custom shower if you are focusing on the master bath. A custom shower can be big or small. Additionally, the shower could include special features like a rain head, side sprays, or steam capability. When it comes to a Highlands NC vacation home many buyers are looking for a spa like experience. As a result, if you are making improvements for resale value then your choice to improve the master bath will pay off. The beauty of a custom shower is that is can be the size and shape that you desire and that the space affords. While many master baths can accommodate both a shower and a tub, others have room for just one. 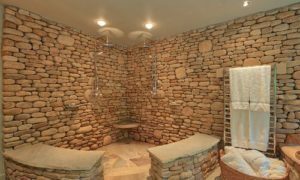 A fabulous custom shower can help a Highlands NC home for sale attract buyers! Contact our team at Berkshire Hathaway HomeServices Meadows Mountain Realty today to learn more about Highlands NC real estate. We welcome the opportunity to update you on current market conditions and home trends. Let our knowledge and experience serve as your guide, hoping you decide if a Highlands NC home remodel makes sense for you.